After a long trying day at work, a break-up, or just a bad day in general, most of us have considered running away to join the circus at least once. As ludicrous as the idea might seem at the time it feels like the only option. So the next time this crazy thought runs through your mind, thanks to Emily at Herciniarts Collective, you can do just that! 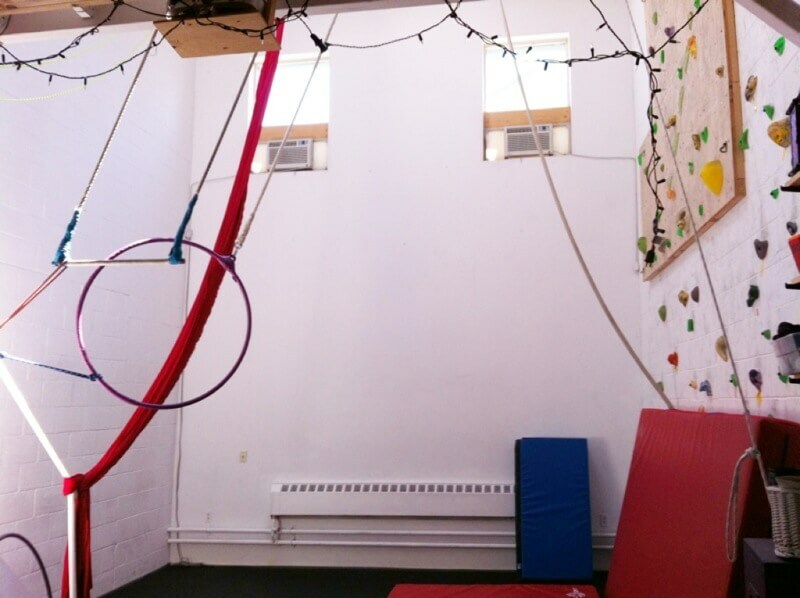 Herciniarts Collective offers private and semi-private class in “Aerial Dance” which is comprised of silks, hoop, trapeze, straps, rope, net, and harness components. Emily herself has just about 20 years of circus experience, 14 of which she has been teaching the art. She has worked for many reputable companies such as A2D2, Toronto Aerial Dance, Zero Gravity Circus, and SmartCulture. This means you can be confidant that you are in good hands! As we arrived at Emily’s Studio, which is located in Liberty Village, I was pleasantly surprised to find a couple of free parking spots located in front of the building. The studio has a charming bohemian feel and is a live/work loft conversion. 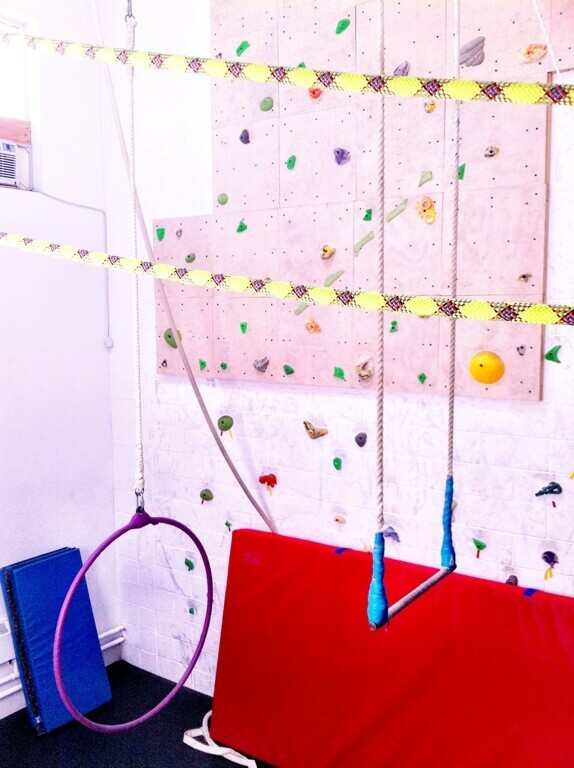 The first thing I noticed as I walked through the doors was silks, a hoop, and a trapeze hanging from the ceiling. Needless to say, my inner child was immediately filled with excitement! Emily also seemed to be quite excited to get the class started and her passion for the art was very evident. Emily started out by asking us a few questions about our flexibility levels. I felt confident that I was fairly flexible… that is until we began doing some simple stretches and I realized that just cause I could “almost do the splits” when I was 10, did not mean the same was true to date. So the warm up was much needed and felt great. Next we moved to the Hoop. Emily showed us some techniques on how to get up on the hoop, as well as some other very basic moves. She helped each of us with individual care, making sure we not only completed the moves, but that we learned each step. Even though I used the word “basic”, at this point I was full blown sweating. Silks was next and by far my favourite, as I do love a challenge! This requires a fair bit of upper body strength, of which I am lacking. However, strong legs can go along way too. Emily was very encouraging the entire time and made sure we were reaching our full potential. Lastly, we tried out the Trapeze! This is what really brought me back to all of those days when I was a kid! I remembered how my best friend and I would take all the clothes out of my closet and try to use the bar as a Trapeze. We would then launch ourselves onto my bed repeatedly…what my mother would have given to have an option like Emily’s Herciniart’s classes then! Being a massive advocate of anything fitness this was a great way for me to get in a great workout and have a blast doing it. I was so focused on completing the moves that I didn’t even realize all the effort I was putting forth. It sure beat the hell out of running mundanely on a treadmill for thirty minutes staring at a TV in the gym. Emily also offers floor acrobatics, yoga, juggling & balancing, and personal fitness training if aerial arts are not quite your speed. However, Emily says her classes are filled with people of all ages and all different fitness levels so please don’t feel intimidated! I recommend swapping out your weekly dinner dates with your girlfriends for one of Emily’s Aerial Arts classes. Or how about ditching the classic movie date with your man for a fun and exciting hour of acrobatics? Not a bad idea right? For more information you can check out their website at www.herciniarts.com or call (416)606-6559. Group classes (max. 4 students): $20-$25, which is dependent on number of participants and length of class requested.